South Boston, VA – A colleague of mine said it best this evening, “What better way to celebrate this great nations independence than with some Late Model racing!” That is what was on tap last weekend as we strolled into South Boston Speedway just as first practice got underway. Talk around the social media portals was this race was going to get washed out, no point in going, Arthur looks to ruin this weekend. Though that third comment may in fact come true, he did not mess with our races too much Thursday evening. On our modified schedule we hit the road just a tad bit after 11 AM EDT for the long but easy trip out west. Forecast models were looking a bit better for race day as the percentages went down, but the threat of rain was still there. We hadn’t talked about the “what if” of a rain out, I wanted this race to happen. Not just for my personal gain of finally experiencing this race but the fun and excitement of working to help you all visualize the action! Now I must admit, I was a little flustered towards the start of the evening. A little worried about 1) having so many cars on the track and missing something, 2) So many new faces and car number I would stumble and fall behind. Well I will chalk that up to the same jitters anyone gets going in front a large crowd, because once those engines were fired and those Late Models were rolling off pit road its like I was in the zone! It was just something about the sight of 28 late models (the #6 of Bobby McCarty ended up loading his car up during the first race of the evening. I never heard any official word as to why) taking to the track for some left turn action. Not to mention getting the chance to watch guys like Phillip Morris (4x National Champ – 2006, 2008, 2009, 2011), Lee Pulliam (B2B National Champ – 2012, 2013), Timothy Peters (Camping World Truck Series). Now do me a favor, add in names like Peyton Sellers who is a previous South Boston track champion, C.E. Faulk III a four-time champion at Langley Speedway but now running a part-time schedule at SoBo, Matt Waltz & Greg Edwards who have has some of the best battles for the win in the entire eastern region. I could probably go on for another paragraph or five about the caliber of drivers young and old that took to the track this past weekend but I don’t think you want to sit here and read all that. Anyway back to the start of the race, it took a little bit longer than what it should have to drop the green flag due to some line-up issues. Not going to call out any names on this one but I really don’t get how hard it is to listen. The tower as an official on the spotter stand, the drivers have a spotter, Mr. Official tells Mr. Spotter to communicate to his driver to fall back one spot to his starting position, why it took just about five laps at 30 mph to make that happen is beyond me. It didn’t take long for Phillip Morris to do his thing and clear the field going into turn one on the start with Lee Pulliam in tow! With a 200 lap race tire management plays a big role in where you are going to be at the end of the race, so seeing Matt Waltz, Greg Edwards, Matt Bowling & Timothy Peters running mid to back of the pack, I wasn’t worried too much! First portion of the race was a lot of driving around seeing what everyone was all about, few solo car spins but nothing terrible. Quarter way through the race Deac McCaskill tried his luck taking the cone and lining up on the outside. It was pretty apparent that the outside groove for McCaskill was just not there. There were a few teams that made the outside work when needed, Waltz for one who made a powerful move on the outside of Bruce Anderson while battling for a top ten spot early, and would use the outside line to move past Pulliam and claim the third spot. Sellers would also make the outside work to take the lead away from Pulliam late in the race, however his lead did not last long as the defending national champ ran him down and moved back to the top spot. Single car cautions plagued the 200 lap feature more than multi car incidents as turn two played host to most of the causes for the yellow flag to fly. Langley Speedway regular Brenden Queen’s night came to an early and abrupt end as he was involved in an accident that caused too much damage to the right front of his machine and pulled him from the race earlier than he has expected. The caution would fly again on lap 80 for the spin of Greg Edwards, little bit of front end damage, he tried to stay out and salvage a finish but would pull the car down pit road a little bit before the half way break and was done for the evening. It was clear early that Phillip Morris was the car to beat and he proved it for the first half of the race, extending his lead at time to as large as six car lengths! When the competition yellow waved the cars were brought down pit road, four crew members were allowed over the wall, tires were allowed to be swapped but not changed and the infamous invert! Morris, Sellers, Waltz, Pulliam, Thaxton, McCaskill, Snider, Oakley, Anderson, Peters would be scored as your top ten, only the top five would be inverted! With that being said Thaxton & Pulliam would lead the field to the green for the next 100 lap section… well 97 laps if you want to get real official! 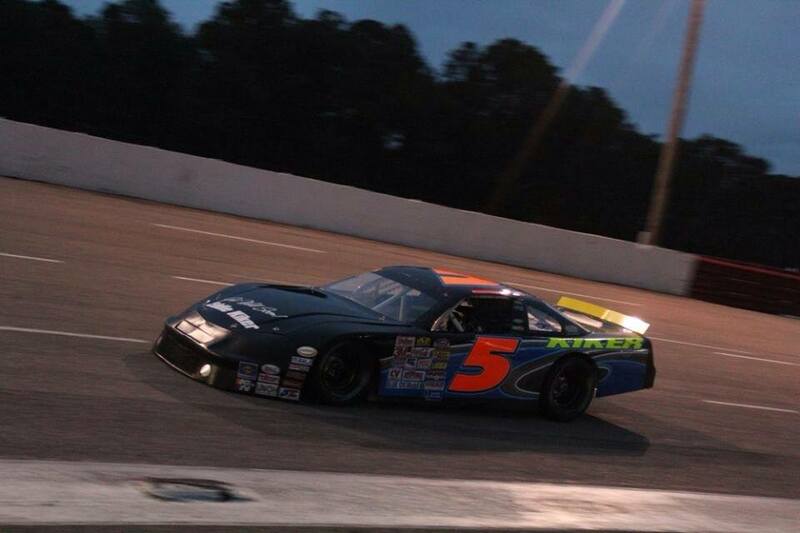 Pulliam would power is #5 Kiker Motorsports car to the lead on lap 104 while Waltz assaulted the rear bumper of Thaxton. Austin Thaxton did one hell of a job holding off the 0 machine of Waltz before his night was brought to a very disappointing end. Morris got into the rear of Waltz, practically picking the rear end of the car up, Waltz looked like he was running around Eldora Speedway as sideways as his machine was. I am going to be completely honest, Waltz should have spun out and hit the wall but this driver was not having any of that. Collecting the car, Waltz would head down pit road to the attention of his crew, attempt to make a few more laps before pulling his ride behind the wall. Not but twenty or so laps go by when the #46 machine of Brandon Gdovic goes up in smoke, a blown engine would end the night and weekend for Gdovic who was really coming on strong there after just riding and saving tires! We will have to wait just a few weeks to see the return of Gdovic on his home track during the Hampton Heat 200 at Langley Speedway. The race would finish in overtime with a green, white checkered due to some trouble with the #36 machine of Chris Johnson in none other than turn two. Pulliam still your leader would have Peyton Sellers & Josh Oakley to his outside. Kaz Grala & Deac McCaskil lined up to the inside behind him. Green flag waved over the field coming out of four and Sellers had the restart of his career! Pulliam and Sellers would remain door to door all the way around the 4/10 banked oval of South Boston with Pulliam edging ahead by a nose. Looking to give it all he had Sellers drove just a bit to deep into one causing his car to push up the track, cutting any hope of winning and opening the door for Grala to edge his #31 Ozlink machine to a second place victory! Pulliam, who now has won four straight 200 lap events at South Boston, pulled his #5 Kiker Motorsports into victory lane. Immediately thanking his crew for all their help getting the car back together. Pulliam kicked off his own version of triple crown with a win in South Boston, saying the crew was heading to Caraway Speedway the next day (July 4th) to run in the Rusty Harpe Memorial, then head to Southern National for Twin 75 lap features. The next leg in the VA Triple Crown series will be held at our hometown track, Langley Speedway July 26th. I can tell you this if you were in attendance and thought this was some good racing then put Langley Speedway on your calendar! For ticket information head over to www.langley-speedway.com or call (757)865-RACE(7223). Some of the best drivers in the region trying to tame one of the toughest short tracks around. Trust me when I say you do not want to miss this!